If you have traveled internationally recently, you may have noticed that TSA has partnered with U.S. Customs and Border Protection (CBP) to implement facial recognition in select airports as an extra layer of security in verifying identities. The TSA just recently announced their roadmap for its future deployment of Biometrics. Step 2, as you can see in the image above, is to begin to operationalize Biometrics for Pre-Check travelers. 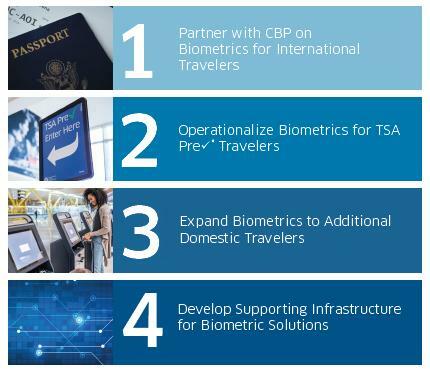 Step 3 will be an expansion of Biometrics to domestic travelers. The benefits to implementing AI-powered solutions, like facial recognition and other biometric applications, will be twofold. It will not only improve safety and security protocols through an increase in accuracy, as it did in this case at Dulles airport in D.C., but will speed the safety screening processes as less and less physical ID requirements are used, meaning a reduction in time to physically review them. There are legitimate privacy concerns surrounding the use and expansion of facial recognition technology and biometrics at airports, as this article does an excellent job of discussing. The need for better communication around the roll-out of such technology, as well as commonsense legislation to protect citizen's privacy, is a very serious issue that cannot be ignored by the makers or users of AI-powered solutions. At Vintra, while we are pursuing contracts with many public safety organizations, we believe all such purchases and deployments by agencies impacting the public at large should be done wisely and with much consideration for the basic rights and privacy issues surrounding the use of artificial intelligence and the public. Read our blog post on The Five Questions You Should Ask Before Purchasing AI.